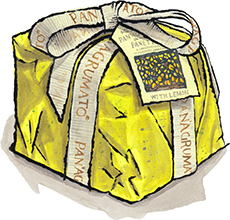 Lemon Panettone for sale. Buy online at Zingerman's Mail Order. Gourmet Gifts. Food Gifts. From the makers of our fan-favorite Agrumato lemon olive oil, this fluffy cake is made with extra virgin olive oil—not butter—made by pressing the olives together with southern Italian lemons, plus ingredients like candied fruit, raisins, flour, eggs and yeast. Feathery light, bright and refreshing with sweet-tart lemon.